When you need extremely rugged and precise steel rulers. Has ultrafine black graduations for easy readability. 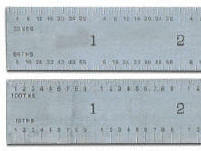 Flexible ruler with 1/2" thick blade. Supplied with plastic case. Graduated in 32nds, 64ths on the first side, 10ths, and 100ths on the other. Quality rules, precision made with ultra fine black graduations on stainless steel finish. Graduated on one side in mm and .5mm, the other side in 10, 20, 50, 100, 16ths, 32nds, and 64ths. Size: 6"x3/4"
Quality 6"x3/4" rules, precision made with ultra fine black graduations on stainless steel finish. Graduated on one side in 8ths & 16ths, the other side in 32nds, and 64ths. Size: 6"x3/4"